The world of interior design is definitely having a modern moment. But the great thing about trends (and yes, modernism is a trend), is that they grow, morph, and change. So you wouldn’t think in a modern moment that embellishments like trims and tassels would be trending, but you’d be wrong. Trims and tassels, like modernism, are both decorating trends and timeless classics and, when used judiciously, can update any space. And right now they are hot again! I was inspired to write this post by the above vignette by Neil Beckstedt, spotted on Instagram. What a lovely timeless quality. Is it from a 1920 modernist Italian palazzo? Or a 21st-century New York townhome? Either way, the tasseled picture hanging gives extra elegance. It’s the same with the room below by Jeffrey Bilhuber. Modern eclecticism is given an extra nudge by the delicious use of moss fringe to elevate a comfy family room sectional. Taped borders on the leading edge of simple linen curtains are always on trend to lend elegance to a modern interior, and are one of my favorite ways to create a couture ambience in even the most minimalist of rooms. Savannah by Samuel and Sons. Modern, minimal and earthy. Onyx Tassel by Houles. At once, both space age modern and tribal. Outdoor Trims by Doug and Gene Meyer. Moss fringe for poolside? I’m in! 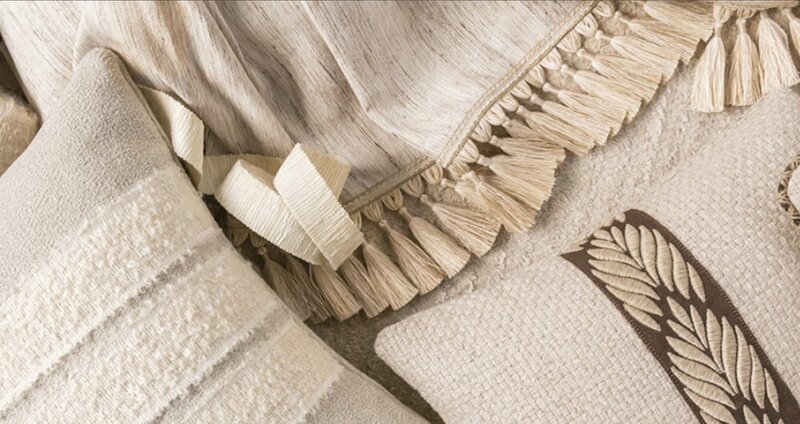 For more inspiration from the fringe, please visit my Trims and Tassels Pinterest board.